U.K. Prime Minister Theresa May said Friday she would form a new government with assistance from Northern Irish unionists to provide certainty and lead Britain in talks with the European Union to secure a successful Brexit deal. May met briefly with the Queen early Friday at Buckingham Palace to ask for permission to form government after an election debacle that saw her Conservative Party lose its parliamentary majority days before talks on Britain's EU departure are due to begin. She added she will stick to the timetable for Britain to leave the EU. "We will continue to work with our friends and allies in the Democratic Unionist Party in particular," she said. "Our two parties have enjoyed a strong relationship over many years and this gives me the confidence to believe that we will be able to work together in the interests of the whole United Kingdom." The DUP — which staunchly defends Northern Ireland remaining part of the United Kingdom, and takes a conservative approach to social issues — increased its number of seats to 10 in Thursday's election. "We will fulfil the promise of Brexit together and over the next five years build a country in which no one, and no community, is left behind," May said. "This will allow us to come together as a country and channel our energies towards a successful Brexit deal that works for everyone in this country, securing a new partnership with the EU which guarantees our long term prosperity." 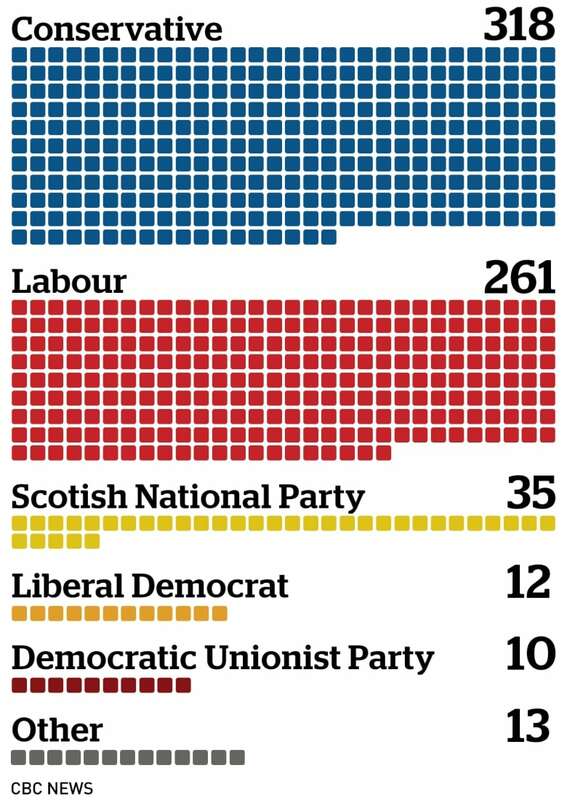 With 649 of 650 seats in the House of Commons declared, the Conservatives had 318 to the Labour Party's 261. Even if the Conservatives won all the remaining seats, the party would fall short of the 326 needed for an outright majority. Before the election the Conservatives had 330 seats and Labour 229. DUP Leader Arlene Foster confirmed that she had spoken to May and would be entering talks with the Conservatives to discuss "how it may it be possible to bring stability to our nation at this time of great challenge." Foster is expected to seek concessions in a new government in exchange for providing the needed seats. 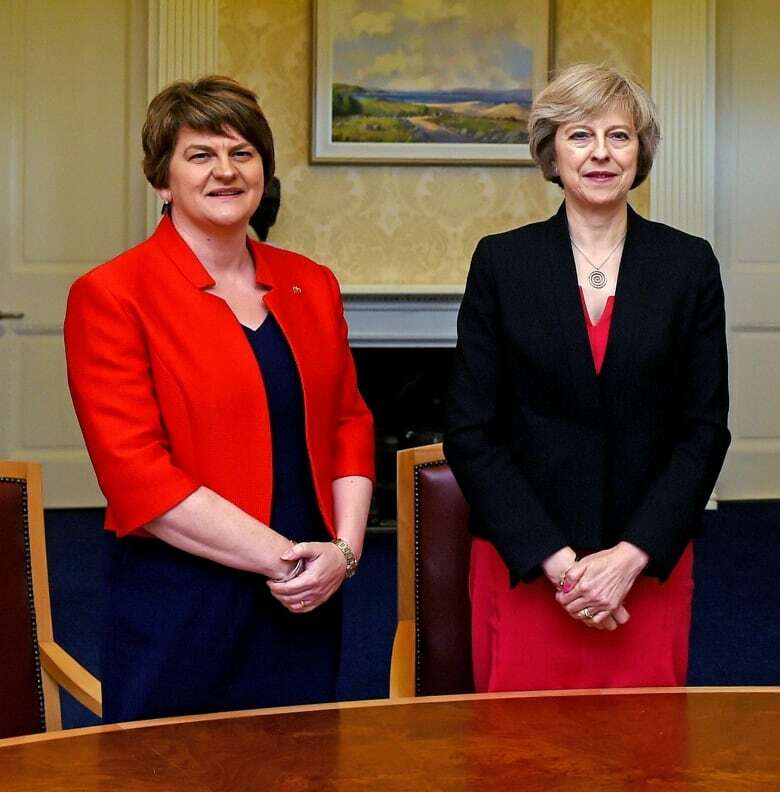 She has not yet made a public commitment to joining a formal coalition which could see DUP MPs having roles in the government, or an informal alliance with the weakened Conservatives. Foster said Friday it would be "difficult" for May to continue in her role. "I certainly think that there will be contact made over the weekend, but I think it is too soon to talk about what we're going to do," she said. Donald Tusk, president of the European Union, congratulated May in the wake of the elections. "I would like to congratulate you on your reappointment as prime minister," Tusk wrote, but added immediately that there was much urgency to start the Brexit negotiations. "Our shared responsibility and urgent task now is to conduct the negotiations on the U.K.'s withdrawal from the European Union in the best possible spirit, securing the least disruptive outcome," he wrote. Theresa May's repeated pledge of a "strong and stable" government has morphed into a pledge of "certainty." He said the March 2019 deadline "leaves us with no time to lose. I am fully committed to maintaining regular and close contact at our level to facilitate the work of our negotiators." Earlier Friday, Scottish National Party Leader Nicola Sturgeon says the Conservative Party's "reckless" approach to Brexit should be abandoned. Sturgeon said the prime minister had "lost all authority and credibility," and should resign. Tim Farron, leader of the pro-EU, centre-left Liberal Democrats, says the mandate May sought for "her extreme version of Brexit" did not get voter support. 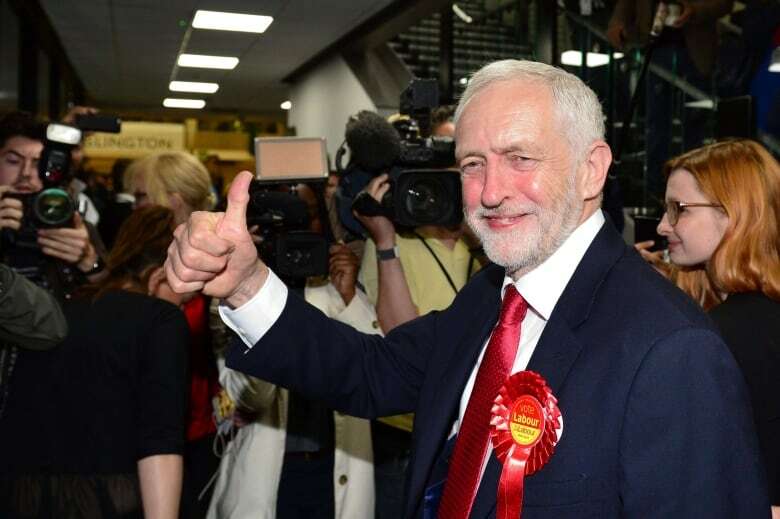 Left-wing Labour Leader Jeremy Corbyn, who was among those calling on May to resign, said Friday morning that people have had enough of austerity politics and cuts in public spending. He ruled out the potential for deals or pacts with other progressive parties in Parliament. "The arguments the Conservative Party put forward in this election have lost, and we need to change." The results confounded those who said Corbyn was electorally toxic. Written off by many pollsters, Labour surged in the final weeks of the campaign. It drew strong support from young people, who appeared to have turned out to vote in bigger-than-expected numbers. May was resoundingly re-elected to her Maidenhead seat in southern England, but many predicted she would soon be gone. "Clearly if she's got a worse result than two years ago and is almost unable to form a government, then she, I doubt, will survive in the long term as Conservative Party leader," former Conservative treasury chief George Osborne said on ITV. British media later reported Friday that May had no intention to resign. The leader of the U.K. Independence Party has stepped down after the right-wing party failed to gain a seat in Britain's general election. Paul Nuttall said it was clear that UKIP needed "a new focus and new ideas." UKIP, which is strongly anti-European Union and anti-immigration, had enjoyed a surge in support in the 2015 general election. 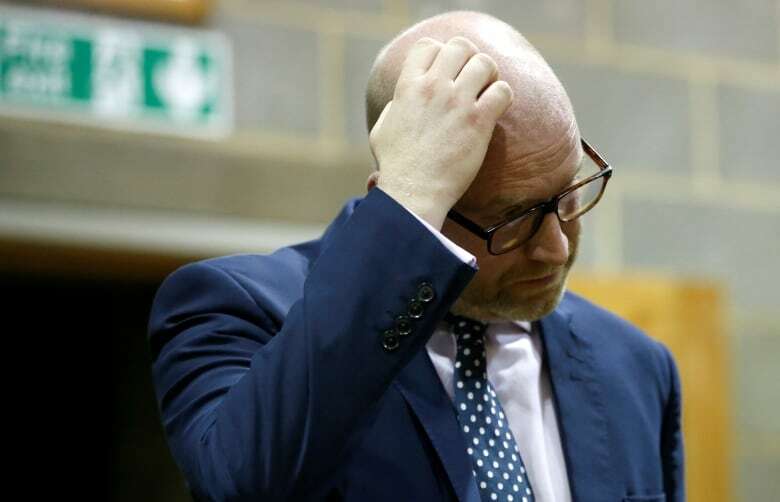 But on Thursday, the party lost its only seat in Parliament, and Nuttall came third behind the Conservatives and Labour in his constituency. 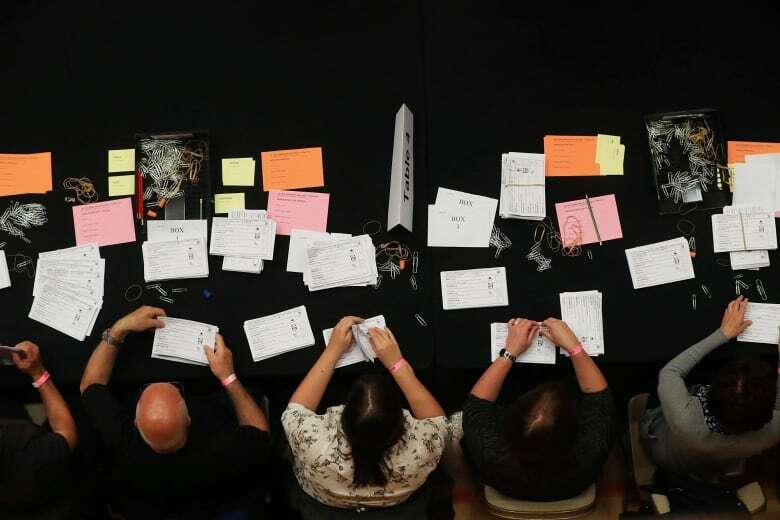 The result was bad news for the Scottish National Party, winning 35 seats. Among the casualties was Alex Salmond, a former first minister of Scotland and one of the party's highest-profile lawmakers. The losses complicate the SNP's plans to push for a new referendum on Scottish independence as Britain prepares to leave the EU. Scottish Conservative leader Ruth Davidson said the idea of a new independence referendum "is dead. That's what we have seen tonight." May, who went into the election with a reputation for quiet competence, was criticized for a lacklustre campaigning style and for a plan to force elderly people to pay more for their care, a proposal her opponents dubbed the "dementia tax." As the polls suggested a tightening race, pollsters spoke less often of a landslide and raised the possibility that May's majority would be eroded. Eight people were killed near London Bridge on Saturday when three men drove a van into pedestrians and then stabbed revellers in an area filled with bars and restaurants. Two weeks earlier, a suicide bomber killed 22 people as they were leaving an Ariana Grande concert in Manchester. "I don't think that's in the hearts and minds of Londoners at the minute, [not] nearly as much as security is," said Sheard, 22. "It was very scary on Saturday."